Indiana’s love affair with the sport of basketball is unrivaled, and, on Saturday, Fox Sports Indiana will, for the third consecutive year, broadcast its love letter to hoops in the Hoosier State with Basketball Day Indiana. The RSN (with an assist from mothership Fox Sports) will broadcast 10 games and more than 14 hours of live coverage on Saturday, showcasing some of the state’s best high school, college, and professional basketball. In a partnership with the NBA’s Indiana Pacers, the WNBA’s Indiana Fever, and the IHSAA, Fox Sports Indiana will broadcast six high school games: two will be played at Bankers Life Fieldhouse in Indianapolis (prior to a Pacers game), and four will take place at North Daviess High School in the small Southern Indiana town of Elmora. Expanding the event’s focus beyond Bankers Life Fieldhouse is the primary focus of this year’s event. For Fox Sports Indiana, it has been about making this edition of the beloved event a celebration to be appreciated statewide. The network is also encouraging high schools throughout Indiana to take part in the event via a social-media campaign that included sending 270 high schools specially branded Basketball Day Indiana flags. Fox Sports Indiana producers are encouraged to integrate social-media content featuring those flags shared by high schools into the live game productions throughout the day. With Fox Sports Indiana headquartered in the Fox Sports’ Saint Louis facility that oversees the Midwest, Kansas City, and Indiana RSNs, Basketball Day Indiana is a full-on road show, run entirely from a pair of IMS Productions trucks parked outside Bankers Life Fieldhouse in Downtown Indianapolis. In addition to housing the productions going on inside the arena, the trucks also pull in feeds from across the state, including games at North Daviess High School and various college venues. According to Mago, the network relies heavily on Fox Sports’ Venue Access Network based in The Woodlands, TX, to deliver much of the transmission via IP and entrusts a cluster of Dajero units to field reporters. Fox Sports’ Charlotte, NC, office is also playing a role in the event, helping build and expand on a custom graphics package designed for this event. In fact, a handful of staffers from the Fox Sports graphics team will be onsite in Indy to assist on the production. The scope of the event is essentially tapping out the local freelance community. The network estimates that 160 crew members will be working Basketball Day events in some capacity. Fortunately, Mago says, as the event has become established over the years, it has become a date that many freelancers circle on the calendar, making staffing much less challenging than in previous years. 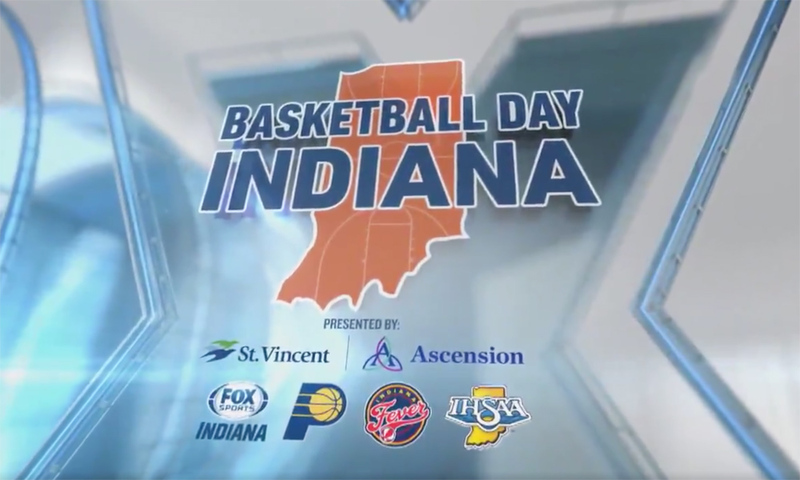 Playing key roles in the production of Basketball Day Indiana include Bill Cochran, Coordinating Producer for Fox Sports Midwest (who is also FS Indiana’s lead producer on Pacers basketball) and Suzanne Michalski, senior production manager for Fox Sports Midwest.